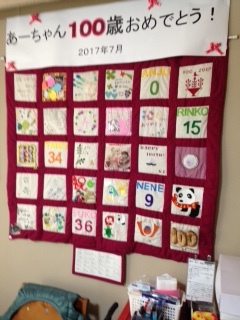 Thanks to the efforts of colleagues in the Faculty of Nursing at Kyoto Tachibana University, I visited 3 elder care services this last week. All were inspiring and each had aspects we can learn from. Kirakuen is part of the Social Welfare Corporation which began in 1982 in response to concerns about poor care. The service is based on the philosophy and principles of ‘normalisation’ and ‘unit care’. Normalisation emphasises human rights, normal activity for older people and integration between the community and the care service. Some readers may be familiar with ‘normalisation’ as underpinning the care of people with learning/intellectual disabilities. In this version for elder care, the values focused on are dignity, privacy and societal freedom. The service has residents and families’ associations so they have a voice in the service activities. Staff are trained to ‘see the history behind each person’; to speak in a polite manner; to knock before entry to residents’ rooms; to enable residents and their families to come and go freely; and to celebrate residents’ culture in the form of music, dancing and community engagement. There is also a bar so residents can enjoy a tipple on a Thursday evening. The idea of ‘unit care’ is to have small groups of older people living together with a good staff/resident ratio. 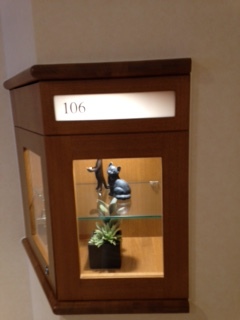 The dementia care area had 2 floors with 9 residents on each. 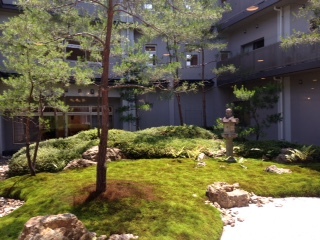 The environment was in a traditional Japanese style, with rooms overlooking a small garden area. The service leader and staff we met oozed energy and commitment and, again, it was possible to see the importance of leadership in making such care environments ethical and sustainable. 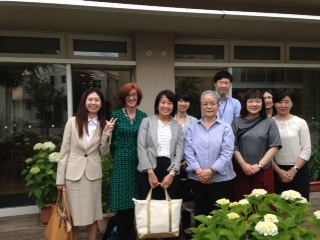 The second visit brought me to the Fushimi-ku Daigo Nakayama-cho residential area, along with 108* student nurses and university staff. Amongst the 600 residents there, half are elderly, and 60 live alone. Buckets and cleaning materials were distributed to small groups of students and each group was allocated a resident who had specified cleaning tasks. I had the privilege of shadowing one group of 5 students as they took instructions from one resident and get on with cleaning an air conditioning unit, windows, bathroom and toilet as well as making coffee and having conversation with the resident. It was a pleasure to watch such willing workers engaging so easily with this gentleman asking him about his life, his family and his health. There was also much laughter. 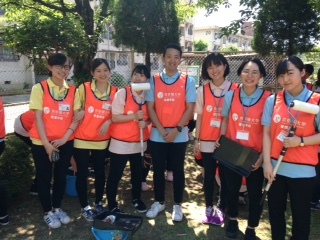 A chance for students, then, to learn about the life of an independent elder and for him to have some cleaning tasks completed and to enjoy the company of these happy young people. The activity was the idea of Professor Kenya Matsumoto at Kyoto Tachibana University and has rightly attracted a lot of media attention. There has been discussion about ethical aspects of robots in care (see, for example, http://journals.sagepub.com/doi/abs/10.1177/0969733016647297) and I had hoped to see this for myself. However, despite the best efforts of university colleagues here, it was not possible to locate a care home with robots. What are your views of robots in care? 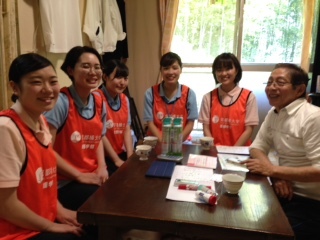 Goodtime Living Saga-Hirosawa is a traditional Japanese style care home that uses advanced technology to enhance care. 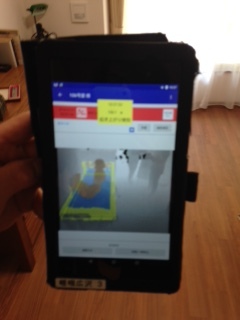 Staff demonstrated equipment and provided good reasons to support the use of sensors in residents’ bedrooms and the use of mechanized human transfer aids. The sensor technology enables staff to observe residents’ movement without compromising their dignity. The devices enable care-givers to better assess residents’ needs and to intervene rapidly should they, for example, fall in their room. Such technology is being developed in the UK also and it is not difficult to see its value. The mechanized human transfer aid is the most discrete, neat and effective I have seen. This one aid enables a care-giver to move residents easily from bed to wash basin and also to the toilet. The overall environment of this care facility is beautifully designed with a garden and calm individual and community living spaces. There is a programme of daily activities and dining areas where residents can be joined by family and friends. As my sabbatical draws to a close – 3 weeks to go – I’m taking stock of our research and education which aims to promote and sustain good care as well as to understand and minimise unethical care. We have reason to be proud of initiatives to celebrate good care, such as the human rights and nursing awards, which will next be presented at our conference in Cork this September (http://inec2018.ucc.ie/ ). I’d like your input again please – What more could be done to value good care-giving?